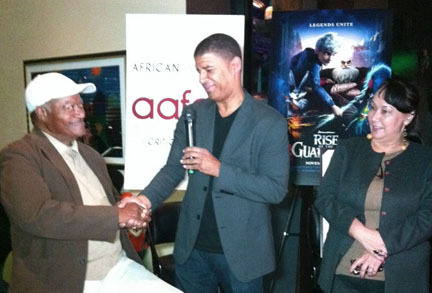 The African American Film Critics Association (AAFCA) held a reception and screening of “Rise of the Guardians” on Saturday, November 17 in honor of African American director Peter Ramsey. The event began at the RAVE Cinemas Baldwin Hills and was followed by a lively Q & A and awards reception at the Post and Beam restaurant. The theater was filled to capacity with 207 VIP guests of AAFCA, including industry professionals and members of grassroots organizations including The NAACP and students from the Debbie Allen Dance Academy and Al Wooten Jr. Heritage Center among others. A gathering of 100 VIP guests met at the reception joined by Gil Robertson, AAFCA President; Kathy Williamson, AAFCA West Coast Vice President; and veteran animator Leo Sullivan in honoring Ramsey with a distinguished AAFCA Award for his outstanding contribution in the field of Animation. Ramsey also received a proclamation from the city of Los Angeles from the office of Councilman Bernard Parks. A champagne toast to the legacy of African-American animators rounded out the event as the final acknowledgment of Ramseyʼs trailblazing excellence as an animator and director. For more information, visit AAFCA.com.